Attempts to check the availability of the LG UltraFine 5K Display for in-store pickup in the United States provides the message "Unavailable for Pickup" in many locations, in AppleInsider's testing. In some areas, such as New York City, there is limited stock available for the display. The unavailability is unusual as Apple has offered store pickup options for the display since its launch, and highlighted it along with the 2016 MacBook Pro redesign. The Apple Website in other markets also offers similar notifications that it is unavailable as a pick-up order, with regional online stores for Canada, the United Kingdom, Germany, France, and Australia. Not all markets are listed as completely unavailable, as pickup is still available in Singapore. While store pickup is not available in the majority of cases, it does appear that customers are still able to order the monitor for delivery. Some stores revealed to AppleInsider the LG monitor hasn't been restocked for a while, with multiple locations said to have sold out "weeks ago" with no new shipments. The current belief expressed to AppleInsider is that retail will sell-through its existing stock and won't receive any further shipments. Typically, a global reduction of availability for a product in the online Apple Store is an indication that something will be changing, such as its removal, a replacement with an Apple-produced version, or an upgraded model. While not completely global, the unavailability for pickup is significant enough to consider there to be something happening soon to the product line. 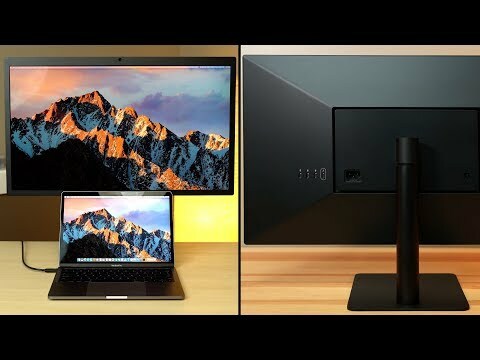 There isn't an obvious reason for the reduced availability, but considering the LG monitor arrived at a time when Thunderbolt 3-equipped monitors were rare, and that market now has many Thunderbolt 3 and USB-C-compatible monitors, it is less of an issue for consumers wanting such a display for their Mac. Apple did advise in 2017 it was working on a new "pro display" to go with a new Mac Pro, originally slated for launch in 2018. While the Mac Pro is now believed to be shipping in 2019, it is possible for Apple to ship the display separately, possibly even earlier than the Mac Pro itself. It is going to be hard to determine what is "pro" It ain't about resolution and Apple displays have had hard time to match EIZO or NEC reall professional graphics displays. Call it wathever you want, but unless you work in area and you see proper colors and grey levels and non-glare and (no washing on edges after 2 years or turning yellow like in cases like iMac's) then you have some odd definition for "pro display". Kill it already. LG released an alpha rush-to-market product. Well I’m a developer, so my definition of “Pro” is a crap-ton of Thunderbolt 3 and USB ports like the Mac Pro. Please feel free to quibble from the standards of whatever industry you’re in, but other professionals exist too. A “professional” Apple display should be color accurate, have calibration facilities, have proper white balance (consistently, across the entire surface, for *many* years), have “a zero dead pixel” manufacturing tolerance, be reflection/glare-reduced AND be a “dock” (port expander for port-starved Macs). No need for speakers. No need for cutesy features (I don’t know what that might be, but Apple has been putting lots of unnecessary cutesy stuff in iOS... looking at you, Animoji...). It would be interesting if this new “pro” display was a microLED (nanoLED?) display, using LEDs as pixels (instead of LCD with backlight), but that technology seems to still be in its infancy, and super expensive. But I’m expecting LG is just iterating this existing display. I expect no pro hardware from Apple this year, mini or otherwise. After the iMac Pro, I’m kind of worried about what a “Mac Mini Pro” would look like. If it’s planned by the iMac Pro team, it likely won’t be cost-effective, which was the whole original point of the mini (and the iMac, right??) and stopped being so, years ago. I'm in a very early stage of planning a little editing rig at home. It crossed my mind that Apple may offer monitors in the not-too-distant future so maybe I should consider them in my planning. I'm wondering about the resolution, though. Not that it's too low, but that it may be too high. It seems likely, based on the iMac and LG displays, that Apple will go with a 27" screen. That's a pretty small space for for that many pixels, and has me wondering if it will result in UI elements and text being too small if the monitors are placed a few feet away from me? I'm also wondering whether pushing that many pixels will have an adverse affect on the performance of my 2016 MacBook Pro (Radeon Pro 460 4GB). Are any of you using the 27" 5K iMac? Would you find the display comfortably legible if it were placed roughly the length of your arm away from you, or maybe even a little further? Other than being able to fit more things on the screen at once, is there any real benefit to 5K over 4K at that size? Would I maybe be better off with 4K monitors in this application? I really hope they release their own monitor again. The old ones were great when they came out. Just give me the slim iMac design and size and I'm happy. While you're at it, build in an Apple TV, so it can function standalone and I can just airplay to it from an iPhone or iPad. Not asking for much seemingly.. I have been using 27" LG 4K Monitors (27UD88-W) with a Macbook Pro at work for quite a while now. They are great and I can't see any real difference in resolution compared to the 5K variant. You can adjust the scaling of UI elements to suit your need, so again in that area there wont be any real difference between 4K and 5K. One big difference is, that the 5K LG is glossy, while the 4K is matte finish. I actually prefer the matte version, as there is almost zero glare or reflections. You just need 1 cable from the Macbook Pro for signal and charging, which is nice. I sit fairly far away from the monitor, about 1.5x arms length and have no issues. Ya know, that's not an awful idea. If Apple makes a display (something of an *if* because i'm not sure there is much in the way off profit in there - partnering with someone else seems sufficient for their current strategy) adding an internal AppleTV is nearly trivial. It is simple as adding the chip. In theory it needs a network connection, but maybe skip the ethernet part. t seems likely, based on the iMac and LG displays, that Apple will go with a 27" screen. That's a pretty small space for for that many pixels, and has me wondering if it will result in UI elements and text being too small if the monitors are placed a few feet away from me? I'm also wondering whether pushing that many pixels will have an adverse affect on the performance of my 2016 MacBook Pro (Radeon Pro 460 4GB). You're overthinking things. UI elements on the 5k iMac map to exactly the same size as the pre-retina iMacs (I personally think that's a pity, I prefer smaller UI, but I don't run the HIG so…). Your graphics card is fast enough to run at least two of them. You want “a zero dead pixel manufacturing tolerance” on 4K displays with upwards of 8 million pixels? Don’t ask for much do ya? First, the words “zero” and “tolerance” don’t exactly go together in the same sentence - almost oxymoronic if you ask me, at least in terms of 6 Sigma quality and manufacturability. Second, I don’t know any manufacturer on the planet who can promise you that. Now, I’m sure they could conduct post-fab inspections and maybe 1 out of 15-20 printed screens might be free of light or dark pixel defects. But that post-fab inspection process would cost you dearly. For professional use I’ll happily take a Class II display with a handful of dead pixels on it. Probably won’t even be able to see them. Light pixels (permanently on) might be more of an annoyance and I wouldn’t accept that. The 27” 5K iMac is a joy to use. You can scale the resolution to suit depending on your working distance from the screen. The simple if somewhat obvious benefit of 5K over 4K is that you can edit 4K content at full resolution and still have space for editing controls. Are you saying that Gene Munster will eventually be proven right after all these years, and that Apple will release an actual AppleTV that is really a TV? Shocking! … This coincides with the reported shortage of replacement displays for damaged iMacs. A ramp-up in production of a new Apple desktop display might explain that shortage. Damn. I had budgeted this for next year. That comment is really helpful on two fronts. First, it tells me that you think my GU load/UI concerns are not a big issue. Second, I was able to prove to my wife that I do *SO* think before I act. In fact, I OVERthink! On my laptop, if I reduce the resolution from native to any other setting it get s fuzzy. My wife's old MacBook Pro looks better at native 1440 than mine does scaled to that setting. That has me wondering if scaling a higher-res monitor will actually look worse than a lower-res monitor running at native resolution. Fortunately it's not anything I have to worry too much about, because if I buy Apple monitors and they don't work out I can just return them. Your graphics card is fast enough to run at least two of them. Again, maybe I'm worrying too much, but I wonder if it will be even more fast enough with lower-res monitors, Like, my car can go 150 miles per hour but the ride experience suffers. It's much more comfortable going 80 miles per hour. Plus running it at 150 puts a bigger strain on the system so it'll fail sooner than if I only go 80. Does that analogy apply here? The simple if somewhat obvious benefit of 5K over 4K is that you can edit 4K content at full resolution and still have space for editing controls. Noted, thanks. That doesn't actually apply in my particular case since I'll be viewing the video on a dedicated monitor, but I get your point. Jeez, I hope not, because it will do much more damage and hit my wallet a lot harder when I throw the @#$%&!!! thing out the window in frustration like I've done a few times with the square hockey puck. The existing model survives a night outside in the rain. A TV version probably wouldn't. Lol. No, if you do editing of course that kind of thing is important. I just think you're underestimating the power of the GPU you have, particularly with regards to the difficulty of what you're proposing. Well yes, everything at non-native gets weird, adds some GPU overhead, and adds some visible lag. As much as I like "more space," it should probably be disregarded and avoided. Fun analogy. I would say that your laptop GPU is designed to maybe go 300mph, and your built-in display is demanding maybe 75mph, leaving a lot of overhead for GPU calculations that are handy for stuff like computational rendering and the kind of thing that the maligned 2013 Mac Pros are actually really good at. With a single 5k display you'd be running at 150mph and still have a lot of that overhead left but not as much. 3D renders or Xcode builds would not be as fast. With two hooked up, you'd get almost none of the benefits of GPU calculation, and now an external GPU is going to start to look like a pretty good deal. This has been my theory. If the mini is indeed coming this fall, they're absolutely going to need a display to market alongside it. The Thunderbolt Display is still on the mini page of the website, so it's not like they swapped that out for the LG at any point, and I don't see them doing that now. Displays are obviously somewhat a simpler problem to solve than a Mac Pro, so I don't see why that couldn't come out now. And yeah this is going to make my new MBP purchase potentially more expensive as I'll definitely want two to replace my 30" ACD at home and the office.